As we continue our examination of 1 John and the apostle’s exhortation to have love perfected in us (4:17), we continue to note this does not mean God’s love, in and of itself, lacks perfection. Instead, we have seen that the confidence with which we are to face the day of judgment is a result of love perfected in us. This simply means that in our sanctification, God’s love becomes complete in our lives. Though His love is effectual, God has decided not to complete our sanctification apart from our own efforts to submit to and manifest His love. He wills and works within us, calling us to work out our salvation in fear and trembling, because He has given us a role to play in our spiritual growth (Phil. 2:12–13). Though in the final analysis our sanctification is the inseparable result of our justification, we must always be careful not to confuse these aspects of our salvation. Our efforts to be holy do not obligate God to declare us righteous in His sight and therefore worthy of heaven. Only the perfect righteousness of Christ, imputed to us through faith in Him alone, enables us to stand in God’s presence. 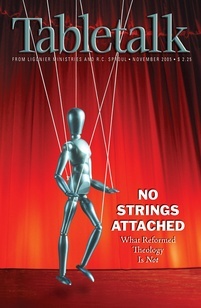 While our efforts play a role in sanctification, they play no role in justification (Gal. 2:15–16). However, as today’s passage tells us, while we are definitely called to work with the Spirit of God so we might be more and more conformed to Christ, God must take the first step in order to guarantee this conformity. For as 1 John 4:19 tells us, “we love because he first loved us.” It is the effectual love of God that first changes our hearts in order to make us capable of love, and it is His example of love that reminds us again and again of our need to love other people. This is plain from verses 20–21, which remind us that God’s love for us, our love for Him, and our love for others are inseparable. If we have been loved by God, we will love God and we will love others. We cannot say we love the one whom we have not seen if we do not love those whom we do see — fellow believers who are also objects of God’s saving love. We are nothing but liars if we say we love God but do not love the brethren (v. 20). How do people know you love God? Is it because you are always proclaiming your passion for Him? Or do people know you love God by the deeds you do for the other Christians you know? Do you harbor secret hatred for other believers while singing praises to the King? If your love for God is not expressing itself tangibly in deeds of love for others, ask Him to change your heart and seek to meet a need of someone in your church today.